Albayrak, T., Caber, M., Moutinho, L. & Herstein, R. (2011). The influence of skepticism on green purchase behavior. International Journal of Business and Social Science, 2 (13). 189-197. Al-Debei, M. M., Akroush, M. N. & Ashouri, M. I. (2015). Consumer attitudes towards online shopping: The Effects of Trust, Perceived Benefits and Perceived Web Quality. Internet Research, 25 (5), 707-733. Aji, H. M. & Sutikno, B. (2015). The extended consequence of green washing: Perceived consumer skepticism. International Journal of Business and Information, Volume 10, Number 4, December 2015, 433-468. Baran, A., Söylemez, C. & Yurdakul, M. (2017). Algılanan yeşil kalite, algılanan yeşil risk ve yeşil marka imajının yeşil marka değeri üzerindeki etkisinde yeşil güvenin aracılık rolü. Uluslararası Yönetim İktisat ve İşletme Dergisi, 13 (5), 1-11. Chang, H. H. & Chen, W. S. (2008). The impact of online store environment cues purchase intention: Trust and perceived risk as a mediator. Online İnformation Review, 32(6), 818- 841. Chang, C. H. (2011). The ınfluence of corporate environmental ethics on competitive advantage: The mediation role of green innovation. J Bus Ethics (2011), 104, 361-370. Chang, S. C., Chou, P.Y. & Wen-Chien, L. (2014). Evaluation of satisfaction an repurchase intention in online food group-buying; using Taiwan as an example. British Food Journal, 116 (1), 44-61. Chaniotakis, I. E. & Lymperopoulos, C. (2009) Service quality effect on satisfaction and word of mouth in the health care industry. Managing Service Quality: An International Journal, Vol. 19 Issue: 2, 229-242. Chen, Y. S. (2010). The drivers of green brand equity: Green brand image, green satisfaction, and green trust. Journal of Business Ethics, 93(2), 307-319. Chen, Y. S. & Chang, C. H. (2013a). Green wash and green trust: The mediation effects of green consumer confusion and green perceived risk. Journal of Business Ethics, 114 (3), 489-500. Chen, Y. S. & Chang, C. H. (2013b). Towards green trust: The influences of green perceived quality, green perceived risk and green satisfaction. Management Decision, 51(1), 63-82. Chen, Y. S., Lin, C. L. & Chang, C.H. (2014). The influence of green wash on green word-of- mouth (Green WOM): The mediation effects of green perceived quality and green satisfaction, Qual Quant (2014), 48, 2411–2425. Dahl, R. (2010). Green washing: Do you know what you’re buying?. Environmental Health Perspectives, 118(6), 246-252. Delmas, M. A. & Burbano, W. C. (2011). The drivers of green washing, California Management Review, 54(1), 64-87. Direction, S. (2013). Shades of green in risk and value: Importance of customers’ environmental perceptions. Strategic Direction, Vol. 29 Issue: 6, 5-7. Eden, S., Bear, C. & Walker, G. (2008). The sceptical consumer? Exploring views about food assurance, Food Policy, 33 (2008), 624–630. Feinstein, N. (2013). Learning from past mistakes: Future regulation to prevent green washing. BC Envtl. Aff. L. Rev., 40, 229-257. Furlow, N. E. (2010). Green washing in the new millennium. Journal of Applied Business& Economics, 10 (6), 22-25. Gillespie, E. (2008). Stemming the tide of ‘greenwash’. Cons Pol Rev 18, 79-83. Hamann, R. & Kapelus, P. (2004). Corporate social responsibility in mining in Southern Africa: Fair accountability or just green wash?. Development, 47(3), 85-92. Harridge-March, S. (2006). Can the building of trust overcome consumer perceived risk online?. Marketing Intelligence& Planning, Vol. 24, Issue: 7, 746-761. Hong, S. Y. & Rim, H. (2010). The influence of customer use of corporate web sites: Corporate social responsibility, trust, and word-of-mouth communication. Public Relations Review, 36 (2010), 389–391. Horiuchi, R. & Schuchard, R. (2009). Understanding and preventing green wash: A business guide. Futerra Sustainability Communications. London. https://www.bsr.org/reports/ Understanding %20_Preventing_Greenwash.pdf. Erişim tarihi: 17.11.2017. Kang, J. & Hustvedt, G. (2014). Building trust between consumers and corporations: The role of consumer perceptions of transparency and social responsibility. Journal of Business Ethics, 125(2), 253-265. Karna, J.,Juslin, H., Ahonen, V. & Hansen, E. (2001). Green advertising: Green washor a true reflection of marketing strategies?. Greener Management International, 59-71. Koçer, L. L. & Delice, T. (2017). Yeşile boyama ve yeşil güven arasındaki ilişkide algılanan yeşil riskin ve algılanan tüketici şüpheciliğinin aracılık rolü. Erciyes Üniversitesi İktisadi ve İdari Bilimler Fakültesi Dergisi, (50), 1-25. Koller, M., Floh, A. & Zauner, A. (2011). Further insights into perceived value and consumer loyalty: A “green” perspective. Psychology&Marketing, 28(12), 1154- 1176. Kordshouli, H. R., Ebrahimi, A. & Bouzanjani, A.A. (2015). An analysis of the green response of consumers to the environmentally friendly behaviour of corporations. Iranian Journal of Management Studies (IJMS), Vol. 8, No.3, July2015,315-334. Langer, A., Eisend, M. & Ku, A. (2008). The impact of eco-labels on consumers: Less information, more confusion?. European Advances In Consumer Research Volume 8. 338- 339. Lifshitz, R., Nimrod, G. & Bachner, Y.G. (2016). Measuring risk perception in later life: The perceived risk scale. Journal of the American Psychiatric Nurses Association, 22(6), 469- 474. Lyon, T. P. & Maxwell, J. W. (2011). Greenwash: Corporate environmental disclosure under threat of audit. Journal Of Economics & Management Strategy, 20(1), 3- 41. Lyon, T. P. & Montgomery, A. W. (2015). The means of end of greenwash. Organization& Environment, Vol. 28(2), 223-249. Mitchell, V. W. (1992). Understanding consumers’ behaviour: Can perceived risk theory help?. Management Decision, 30(3), 26-31. Mitchell, V. W. (1999). Consumer perceived risk: Conceptualisations and models. European Journal Of Marketing, 33(1/2), 163-195. Mitchell, V. W. & Papavassiliou, V. (1999). Marketing causes and implications of consumer confusion. Journal of Product & Brand Management, 8(4), 319-342. Mitchell, V. W., Walsh, G. & Yamin, M. (2005). Towards a conceptual model of consumer confusion. NA-Advances in Consumer Research Volume:32, 142-150. Murphy, P. E. & Enis, B. M. (1986). Classifying Products Strategically. The Journal of Marketing, 24-42. Nyilasy, G., Gangadharbatla, H. & Paladino, A. (2014). Perceived greenwashing: The interactive effects of green advertising and corporate environmental performance on consumer reactions. Journal of Business Ethics,125(4),693-707. Oliver, R. L. (1996). Satisfaction: A behavioral perspective on the consumer. McGraw- Hill, New York. Özel, A. P. (2012). Çevresel reklamlarda yasal düzenlemeler ve etik tartışmaları. Akdeniz Üniversitesi İletişim Fakültesi Dergisi, 17, 9-34. Özel, A. P (2015). Çevresel aktivizm, halkla ilişiler ve yeşil aklama üzerine kuramsal bir bakış. Selçuk İletişim, 8(4), 73-89. Parguel, B., Benoît-Moreau, F. & Larceneux, F. (2011). How sustainability ratings might deter ‘greenwashing’: A closer look at ethical corporate communication. Journal Of Business Ethics, 102(1), 15-28. Peattie, K., Peattie, S. & Ponting, C. (2009). Climate change: A socialand commercial marketing communications challenge. Euro Med Journal of Business, 4(3), 270-286. Ranaweera, C. & Prabhu, J. (2003). On the relative importance of customer satisfaction and trust as determinants of customer retention and positive word of mouth. Journal of Targeting, Measurement and Analysis For Marketing, Vol. 12, 1, 82– 90. Polonsky, M. J., Grau, S. L. & Garma, R. (2010). The new greenwash? Potential marketing problems with carbon offsets. International Journal of Business Studies,18(1), 49–54. Rousseau, D. M., Sıtkın, S. B., Burt, R. S. & Camerer, C. (1988). Not so different afterall: A cross discipline view of trust. Academy of Management Review 1998, Vol. 23, No. 3, 393-404. Satta, G., Parola, F., Penco, L. & Persico, L. (2015). Word of mouth and satisfaction in cruise port destinations.Tourism Geographies, 17(1), 54-75. Slaughter, R. (2008). Avoid the pitfalls of 'greenwash'. Home Furnishings Business, 3(2), 32-36. Slevitch, L., Mathe, K., Karpova, E. & Scott-Halsell, S. (2013). “Green” attributes and customer satisfaction: Optimization of resource allocation and performance. International Journal of Contemporary Hospitality Management, 25(6), 802-822. Söderlund, M. (1998). Customer satisfaction and its consequences on customer behaviour revisited: The impact of different levels of satisfaction on word of mouth, feedback to the supplier and loyalty. International Journal of Service Industry Management, Vol. 9 Issue: 2, 169-188. Su, L., Swanson, S. R. & Chen, X. (2015). Social responsibility and reputation influences on the intentions of Chinese Huitang Village tourists: Mediating effects of satisfaction with lodging providers, International Journal of Contemporary Hospitality Management, Vol. 27, Issue: 8, 1750-1771. Tekin, M., Şahin, E. & Göbenez, Y. (2014). Postmodern pazarlama yaklaşımıyla modern pazarlama yöntemleri: Güncel şirket uygulamaları. Selçuk Üniversitesi Sosyal Bilimler Enstitüsü Dergisi, 225-232. Turan, F. (2007). Çevre dostu şirketler: Yeşil göz boyama mı çevresel üretim mi?. İnsancıl Dergisi, 17, 1-26. Tuten, T. (2013). Promoting sustainability by marketing green products to non-adopers. Gestion 2000, 30(3), 93-102. Türk, M. & Gök, A. (2010). Yeşil pazarlama anlayışı açısından üretici işletmelerin sosyal sorumluluğu. Elektronik Sosyal Bilimler Dergisi, 9(32), 199-220. Walsh, G. & Mitchell, V. W. (2010). The effect of consumer confusion proneness on word of mouth, trust and customer satisfaction. European Journal of Marketing, 44(6), 838-859. Yavuz, Ş. (2009). Yeşil halkla ilişkiler ve ikna. İstanbul Üniversitesi İletişim Fakültesi Dergisi, 37,128-143. Zeithaml, V. A. (1988). Consumer perceptions of price, quality and value: A means-end model and synthesis of evidence. The Journal Of Marketing, 52 (3), 2-22. ISNAD YAPRAKLI, Tevfik Şükrü , YILDIZ, Tuğba . "YEŞİL AKLAMANIN ALGILANAN RİSK, KALİTE VE MEMNUNİYET ÜZERİNDEKİ ETKİSİ". 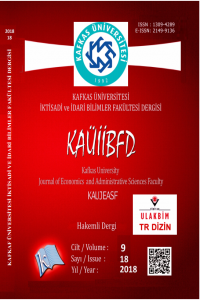 Kafkas Üniversitesi İktisadi ve İdari Bilimler Fakültesi Dergisi 9 / 18 (December 2019): 359-378.